There are many articles online discussing human cheese ?! Let us investigate like good myth busters! Casein's are defined as the proteins in milk that precipitate out at pH4.6. In cheese making lactic acid bacteria is added to the milk. As a waste product they make lactic acid. This acid drops the pH of milk below 4.6. The solid matter, called curds, is then sieved out, compacted and left to age in brine - or whatever aging process is. The fluid that is not the curd is called whey. As part of the EIT talk I did a live demonstration for the first time. It went really well - and worked. Had four groups each with two bowel and a table spoon. Got them to put a a table spoon of cows milk in one and human milk in other. Then adding table spoon of vinegar. You can try this at home, very simple as the photo to the left shows. We made cows cheese (well curds and whey) and human cheese (well you can't). This is a dramatic illustration of how different Human and other milk is. Human milk has very little. The shot to the left is what happens with cows milk. The curds are the speckly white bits, and the whey is the liquid part. Unfortunately I don't have a breast milk and vinager shot. But imagine a watery milk, with very very little solid curd bits in it. The reason for this difference in the composition is to do with growth patterns. 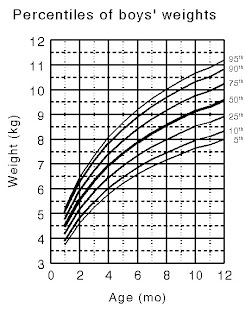 Looking at the baby growth chart below, boys go form about 4kg to about 8kg at 6 months. So babies approximately double their weight in the first six months. Where as calf growth rates are shown also below. In 6 months they go from about 25kg to 125kg, or 5x their birth weight in 6 months. Therefore cows milk is high in casein which turn to curds in their stomach and as they slowly digest this large lump of cheese, putting on muscle and growing quickly. Where are babies get their short term energy needs from milk, plus a small amount of protein for muscle growth. So this is a great illustration that you can use to show the significant differences between breast and formula milks. There is even a mum who has tried to make human cheese and failed for the above reasons.